This page supports specialist and non-specialist teachers, providing background information about concepts and research stories or narratives underpinning the LENScience-BioProtection learning and teaching resources. Exploration of ecosystems occurs every day in classrooms around the world. From food webs to the impact of humans on the environment, exploration of ecosystems offers many opportunities for learning that links to the lives of students. Many socio-scientific issues are linked to knowledge and understanding of ecosystems. Sustainable food production; food security; the impact of mass-agriculture on the environment; the loss of pollinators such as the honeybee... While these issues are complex, many are issues for which children and adolescents can take actions. These can be as simple as eating in-season foods, or as complex as investigating how increasing biodiversity in a garden could reduce the need for oil-based fertilisers. Professor Steve Wratten is passionate about making the work of the BioProtection Research Centre accessible to children and adolescents. He understands that to do this, the Centre must collaborate with teachers. However, before teachers can facilitate access for children, adolescents and families to these fascinating stories of science, teachers themselves need to become familiar with the stories of the BioProtection Research Centre. These pages are designed to support you as a teacher to become as passionate as Steve is about what ecosystem services are, and how simple actions in communities can have a positive impact on the health of people and the environment and therefore on the social, economic wellbeing of communities. 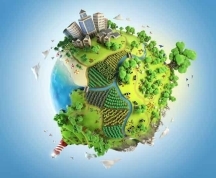 We also offer a direct connection to Steve, his team, and other teachers using these resources in classrooms via the Blue 2B Green community group within LENScience Connect. Biodiversity is simply the variety of living things found in an environment. This includes diversity within and between species, as well as diversity of ecosystems found on Earth. Biodiversity loss caused by human actions is a highly significant socio-scientific issue. One quarter of Earth's land surface is now cultivated. This is as a result of the increasing demand for food and fibre created by the growing global population. The greatest cause of biodiversity loss is the use of moncultures in modern agriculture. Monocultures, where single crops are grown on mass, produce large amounts of food and fibre, but cause significant problems. They require many inputs including irrigation, fertilisers and pesticides, and cause pollution through the intense use of oil to provide the inputs they require and to ship the products to distant markets. They cause damage to landscapes, and create a loss of soil fertility. Ultimately loss of biodiversity has many negative impacts on human health and wellbeing. 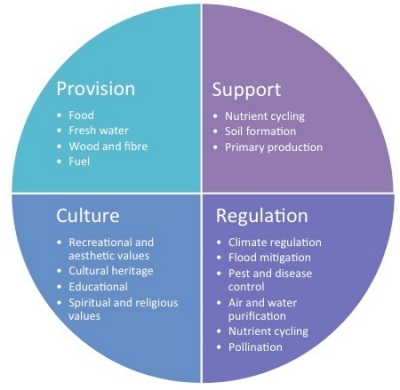 Increasingly ecosystem services are being assigned a monetary value as a way of measuring and comparing their contribution to our society and the impact of human activity on ecosystems and their ability to continue to deliver the services. Research at New Zealand’s Bio-Protection Research Centre has focussed on increasing biodiversity in and around vineyards and pastoral farms with the goal of significantly increasing the variety, quantity and quality of ecosystem services provided, including the biological control of pests and diseases. Deputy Director of the Centre, Steve Wratten is particularly interested in improving conditions for natural enemies by using Conservation Biological Control - the management of pests by modifying the environment to encourage the presence of natural enemies. Conservation Biological Control can potentially improve farm profitability by increasing yields as pest damage is reduced. Profitability increases due to a reduction in pesticide use therefore lowering costs without loss of yield, and increased demand for the product due to reduced levels of pesticide residues. There is a further benefit from public perception of a healthier environment. How do you go about improving conditions for natural enemies? Steve uses the acronym SNAP to summarise the four key factors that natural enemies need: Shelter, Nectar, Alternative food and Pollen. By providing food and habitat sources for beneficial species, biodiversity is boosted and hopefully the numbers of natural enemies are increased. SNAP in action: A beetle bank provides SHELTER. Extracting NECTAR from Muehlenbeckia. A predatory beetle feeds on aphids as an ALTERNATIVE FOOD source before other pests arrive. A hoverfly takes POLLEN from a daisy.